Plastic, metal, shrink plastic, rubber, leather, polymer clay, laminated paper, coated paper, uncoated paper, photo, glass, porcelain, terracotta, cellophane. 3 seconds (porous surfaces) - 5 minutes (non porous surfaces). Drying time varies based on surface / material, humidity, etc. The patented sliding pallet keeps ink colours separate and prevents the colours from bleeding together. Slide the pallet together to use Kaleidacolor with a brayer or stamp. Colours are extremely vivid on coated paper. To use, slide the lever toward the inkpad - the pallet will slide together. Once it clicks, the colours will be locked together and ready for use. When finished, slide the lever away from the inkpad. Once it clicks, the colours will be locked into a separated position and ready for storage. Use with coated paper and VersaMark for beautiful resist images. Slide the lever to move the colours together to use and apart for storage. 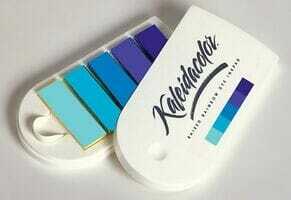 Customer evaluation for "Tsukineko - Blue Breeze Kaleidacolor Ink Pad"